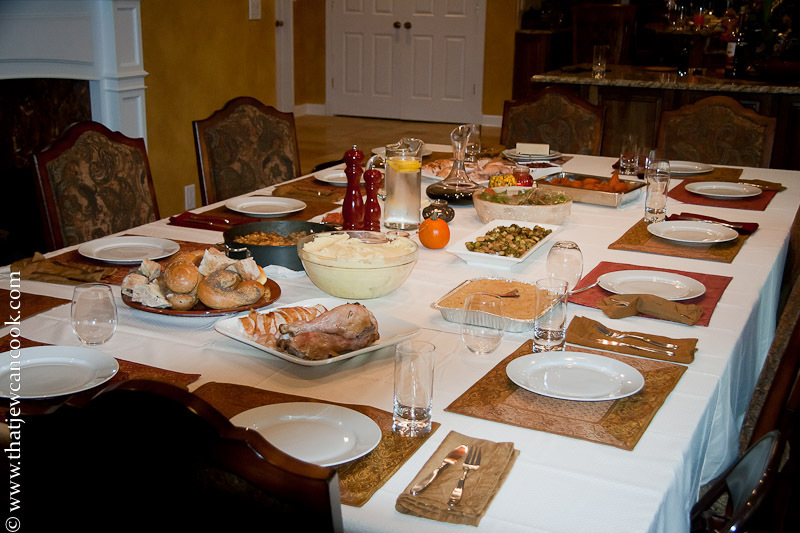 Thanksgiving at the Jew residence 2009. Table for 14. Not much content here, just wanted to wish my loyal (or not so loyal) readers a happy Thanksgiving! Hope you are spending your time with loved ones (or at least lusted ones) and gorging yourself silly. This year we’ll have 14 people and I’ve gone with two 15 pound fresh killed turkeys. One was brined, the other will just be salted and peppered. I want to settle the importance of brining question once and for all. More on this soon. Post Thanksgiving update: Leftovers almost gone, and the brined bird won hands down. Even the leftovers were juicier. Next year instead of two turkeys we do a normal turkey (brined) and a turducken. The view out of my front window on Thanksgiving 2006. 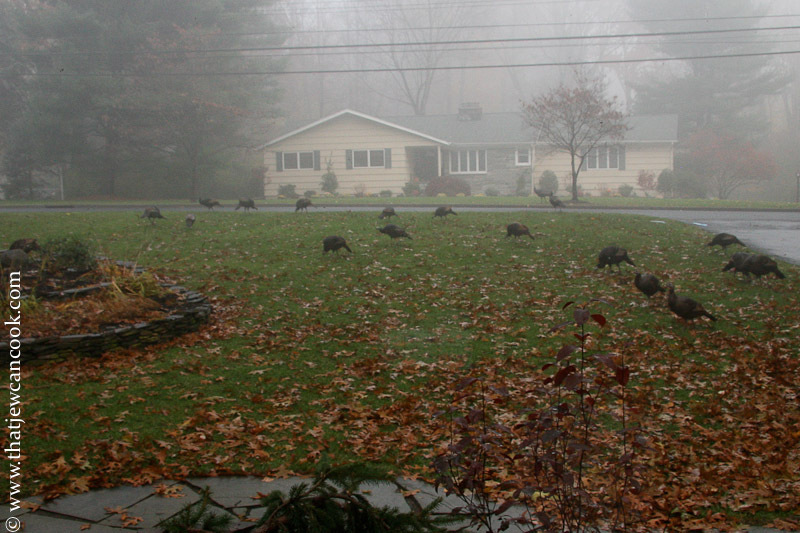 These wild turkeys must have thought the coast was clear! 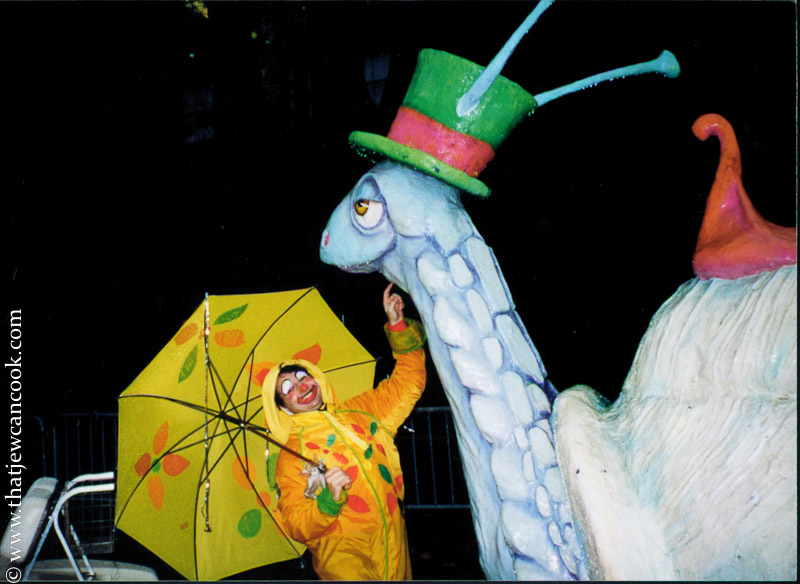 Mr. TJCC himself in the Macy’s Thanksgiving parade circa late 90’s. Boy they don’t make escargot like they used to! 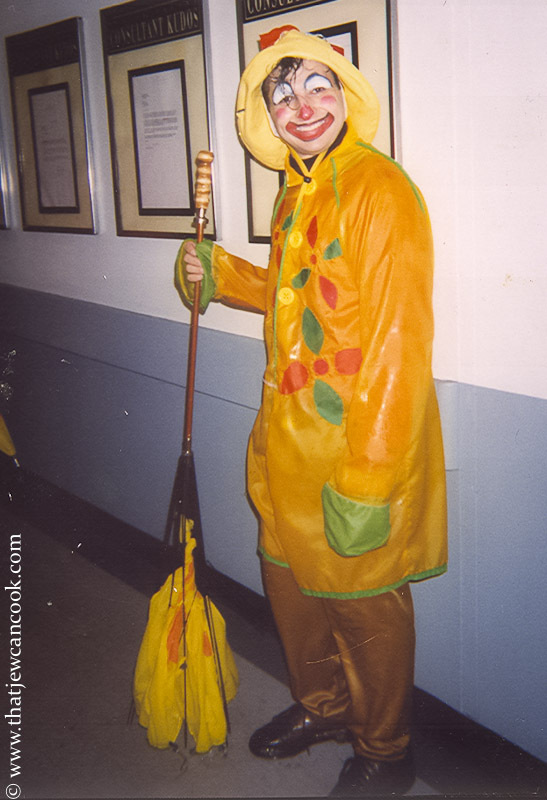 Awwww, you look so cute as the clown! Was that Macy’s parade you were in? Hope you had a wonderful Thanksgiving! I got “lucky” and made two sides: mash loaded with cream and buttah and green beans in a creamed mushroom sherry sauce! Divinely decadent! I want to ask you, do you do any traditional Jewish dishes on Thanksgiving? At my dad’s we always had ravioli. Hey La Diva! It was the Macy’s parade. I have a few friends that used to work at Macy’s corporate, and they got me into the parade for a few years (as a clown, balloon handler, golf cart driver, etc). Fun stuff, and got to see the balloon shop up close and personal…haven’t done it for years, as it’s tough to go to the parade AND host! I made 12 pounds of similar mashed potatoes (buttah and milk)! Nicole’s family loves it, but I am more of a stuffing guy for my carb loading. So what did your mixology bring for Thanksgiving? Anything interesting? Andy, I agree wholeheartedly about the salad! Actually, besides wine, I left the libations to my neighbor’s mum from the UK: Jello shots! They went down a dream! I’ve decided that on Thanksgiving, La Diva hands over the reins to others and takes a break. I’ve got Christmas and New Years coming up yet, those are MY big cooking and cocktail days! That’s pretty cool about the parade, it’s tradition that we lie in bed and watch it all on two channels! After all of these years watching, I’ve only just realized that the TV production is all a big promo for new shows on TV, upcoming stars and Broadway musicals! I still enjoy it though! Don’t forget a many hour long Macy’s commercial! Andy, I went to the mother’s house for thanksgiving and she brined the turkey this year. It was the best turkey I have had in my whole life. It was tender, juicy and delicious – and I am not really a turkey fan. With the exception of turkey salad sandwiches which I love. Totally agree, Mario, the brined bird was juicier and definitely the way to go…Happy t-day to you guys! I am not surprised that the turkey that was brined won hands down-You strike me as a brining guy. What are the birds(?) in your yard? Happy Thanksgiving to you and your family. I ate myself silly. and I still have too many leftovers. Surprisingly I’ve never brined before, now I will need to try it with all kinds of meats. The birds are all wild turkeys, they come out in ones or twos occasionally, but we thought it hysterical that 20 of them were on the lawn on Thanksgiving day! OK – I have ALWAYS wanted to do what you just did – compare brined and unbrined… now give us your brined recipe. I would love to have it. I brined one once – and could not tell the difference – but was not comparing… so I no longer brine. I am picking up my turkey today and serving it tomorrow, so probably to time to brine this one, is there? And your table(s) look fantastic. How did you have the room for this many people??? I am so sad that I have not been here earlier. I have missed you! What a wonderful opportunity to have been part of the Macy’s parade from the inside!!! The more I get to know about you – the more I am amazed!